Second Deputy Speaker of the Palestinian Legislative Council Hassan Khreisheh said the efforts of U.S. Secretary of State Kerry and his visits to the region will put more pressures on the Palestinian and Arab side to recognize Israel. He said that Kerry is deceiving the Palestinians in order to gain more time for the benefit of Israel. Khreisheh told Quds Press that "the leadership of the Palestinian Authority is waiting for the results of Kerry's efforts to return to negotiations with the occupation more than its preoccupation with the internal situation. " Concerning the resignation of Prime Minister Dr. Hamdallah, the Second Deputy Speaker of the PLC demanded the Ramallah authority's President to form a government of national salvation. He demanded Abbas to go to Gaza and announce the national consensus government that will include the different forces and factions. Khreisheh asserted that America, Israel and Europe have nothing to offer to the Palestinian people, noting that 20 years of negotiations have served only the occupation's interests. 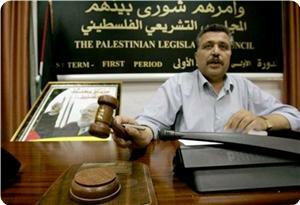 "Extracting the rights can only be achieved through the unity and a unified strategy," the Palestinian leader said. US Secretary of State John Kerry on Thursday entered two days of intense talks with Israeli and Palestinian leaders, voicing hope that they want peace but warning they must show progress soon. In his fifth visit in as many months, Kerry will have lunch with Jordan's King Abdullah II and then dinner in Jerusalem with Israeli Prime Minister Benjamin Netanyahu. He returns to Amman for lunch Friday with Palestinian president Mahmud Abbas. 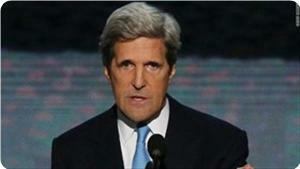 US officials have cautioned against any immediate breakthroughs and Kerry has promised to show patience. But he has also warned that the long stalemate in one of the world's most intractable conflicts is unsustainable. "The time is getting near where we need to make some judgements," Kerry said Wednesday in Kuwait City before flying to Jordan, calling for action "as soon as we can". While refusing to set a deadline, Kerry was acutely aware of risks if there is no headway by September -- the annual UN General Assembly where a frustrated Abbas could rally international opinion against Israel. "Long before September, we need to be showing some kind of progress in some way, because I don't think we have the luxury of that kind of time," Kerry said. "It is urgent because time is the enemy of a peace process," Kerry said. "The passage of time allows a vacuum to be filled by people who don't want things to happen." In a stark reminder of the challenges for Kerry, an Israeli planning committee on Wednesday granted final approval for the construction of 69 new settler homes in annexed east Jerusalem. "Israel is sending message after message to Kerry that settlement is their response to any (peace) initiative," senior Palestinian negotiator Hanan Ashrawi told AFP. "And then they blame the Palestinians for not coming to the negotiating table," she said. Ashrawi also faulted the United States, saying that Israel's main international ally "is playing blind and deaf about Israel's actions and its declarations". The United States gave a low-key reaction to latest construction ahead of Kerry's visit, with no public repudiation of the move. "Obviously steps like this are unhelpful, but we remain hopeful that both parties will recognise the opportunity and the necessity to go back to the table," a senior official traveling with Kerry said on condition of anonymity. The Israelis and Palestinians have not held direct talks since September 2010, but even then their meetings fell apart quickly. The Palestinians want Israel to halt all settlement construction and to accept as the basis of negotiations that it will withdraw from land seized in 1967. Israel says it will only talk without such "pre-conditions". Netanyahu has said his goal is not just to "tick the box of starting negotiations" but to persevere in talks "to deal with the issues and reach an agreement that will resolve the essential issues of the conflict". Kerry has insisted both Netanyahu and Abbas are committed to peace but acknowledged the veteran politicians face daunting challenges at home. Netanyahu, whose relations with President Barack Obama were tense over the US leader's stance on the peace process in his first term, emerged from January elections with a coalition that takes an even more critical stance. Hardline Deputy Defence Minister Danny Danon, who earlier this month said the coalition would oppose moves towards a Palestinian state, is poised to take over several key positions within Netanyahu's Likud Party. Kerry, a veteran US senator, has vowed to press on and has tasked his advisers with coming up with an economic development plan which he hopes can entice the Palestinians and Israelis to seek a peace settlement. Aaron David Miller, who spent 25 years as an adviser on Arab-Israeli negotiations to US secretaries of state, said he has "never seen one as self-assured" as Kerry on the peace process. 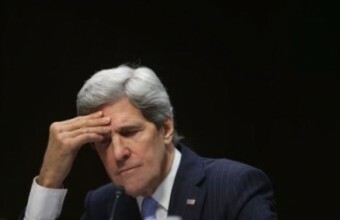 Writing in the journal Foreign Affairs, Miller called Kerry "the Lone Ranger of the Middle East". US Secretary of State John Kerry voiced confidence on Wednesday that Israeli and Palestinian leaders both wanted peace as he called for progress "as soon as we can" in moving towards talks. After stops in Qatar, Saudi Arabia and Kuwait, Kerry arrived in Jordan where he was to focus his energies on drawing Israel and the Palestinians back into direct negotiations after a hiatus of nearly three years. On his fifth trip to the region in as many months, Kerry was to meet King Abdullah II in Amman before holding talks in Jerusalem with Israeli Prime Minister Benjamin Netanyahu on Thursday, then meeting Palestinian president Mahmud Abbas in Jordan's capital a day later. "I wouldn't be here now if I didn't have a belief that this is possible. 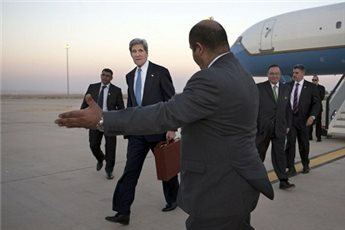 But it's difficult -- we all know how difficult," Kerry told reporters in Kuwait shortly before taking off for Amman. But in an illustration of the uphill battle Kerry faces, an Israeli planning committee on Wednesday granted final approval for the construction of 69 new settler homes in annexed east Jerusalem. "The municipal committee has today given its final approval for the construction of 69 homes in Har Homa," said Jerusalem councilor Meir Margalit, describing it as a "blind provocation against Kerry". 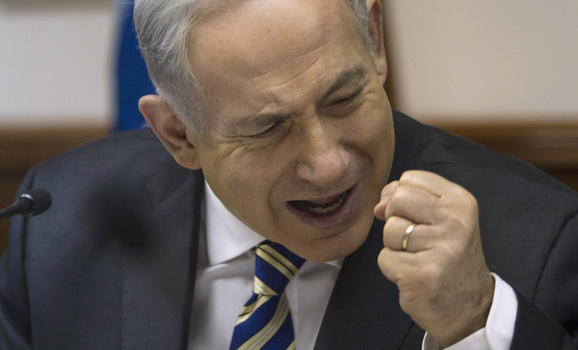 "It proves just how much the government of Bibi (Benjamin) Netanyahu wants peace," he retorted. Har Homa is a particularly contentious area on Jerusalem's southern outskirts where construction is likely to have a serious impact on the sector's boundary with the West Bank, experts say. The last time the parties held direct negotiations was in September 2010, but they broke down just weeks later when Israel failed to renew a freeze on construction of new West Bank settler homes. The Palestinians want Israel to halt all construction and accept the 1967 lines as the basis for negotiations, while Israeli officials say they will only talk if there are no such "pre-conditions". On Wednesday, the Palestinian Authority reaffirmed its position on settlements and 1967 lines, dismissing as "misleading" Israeli reports that Abbas was poised to water down his stance following pressure from Kerry. "The Palestinian leadership has supported Secretary Kerry's initiative... Unfortunately, the Israeli government continues with policies on the ground that contradict and prejudice the very outcome of negotiations," it said. Earlier, Kerry admitted both Abbas and Netanyahu had "been tested" but described them as "very skilled veterans" of Middle East politics. "I am quite confident in their serious commitment of purpose," Kerry said. "I believe they believe the peace process is bigger than any one day or one moment." Netanyahu, who already had a tense relationship with Barack Obama during the US president's first term over pressure on the peace process, emerged from January's elections with a hardline coalition deeply sceptical of compromise. Even within his own Likud, Netanyahu is losing ground to the radical right. Hardline Deputy Defence Minister Danny Danon, who earlier this month said the coalition would oppose moves towards a Palestinian state, is poised to take over several key positions within the party. Coalition partner Naftali Bennett, who heads the far-right Jewish Home party, said the Palestinian issue was akin to "shrapnel in the buttocks" -- something that Israel simply had to live with. Kerry has steered clear of setting a deadline but said he hoped for progress "as soon as we can" -- especially before the annual UN General Assembly in September, when Abbas could make a fresh bid to rally international support. "Long before September, we need to be showing some kind of progress in some way because I don't think we have the luxury of that kind of time," Kerry said. "The passage of time allows a vacuum to be filled by people who don't want things to happen." But he eschewed the idea of establishing a time frame, saying: "Deadlines can become self-imposed hurdles, and in fact impediments, to actually making progress." Netanyahu has said his goal is not just to "tick the box of starting negotiations" but to persevere in talks "to deal with the issues and reach an agreement that will resolve the essential issues of the conflict." Kerry's stops in Qatar and Saudi Arabia focused mostly on coordinating assistance to Syrian rebels fighting the regime of President Bashar al-Assad. On his visit to Kuwait, he thanked the oil-rich state for hosting an international conference in January that raised some $1.6 billion (1.2 billion euros) in humanitarian assistance for victims of Syria's conflict. Israel's Prime Minister Benjamin Netanyahu and President Shimon Peres on Thursday rejected the idea of a bi-national state during a memorial for Theodore Herzl in Jerusalem. "We do not want a bi-national state," said Netanyahu, adding "but let's not delude ourselves, even if we sign an agreement with the Palestinians it won't end the wild defamatory accusations against the Jewish state." Peres warned that a bi-national state "contradicts Herzl's vision. It threatens the State of Israel's Jewish and democratic character." Netanyahu was primarily concerned with international criticism of the Jewish state. "Israel is rated as a country with a negative influence on the world, alongside Iran, and it doesn't matter what we do. "Because it's not about the facts, it's about the defamation of Israel and our portrayal as peace rejecters, war mongers instead of an enlightened nation that is fighting against aims to destroy us." The prime minister said that the accusations leveled at Israel's policy are "exaggerated and groundless but they still – and it doesn't matter whether we're at the height of a peace process. We want peace because we want to live in peace." Netanyahu stressed that any peace accord that may be reached must be based on Israel's ability to defend itself. "Without security and the army that Herzl envisioned we cannot defend ourselves. Security is a fundamental condition for the existence of peace. I think that most Israeli citizens understand this and I believe Herzl understood it very well." 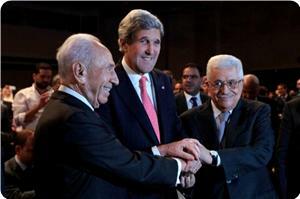 Peres on his part said, "The chances for the renewal of the peace process must not be missed. We welcome the arrival of Kerry to Israel in an effort to renew peace and we shall all help him along." He stressed that Herzl's Zionist vision was based on values of peace. "Herzl was right when he said that a Jewish state was absolutely necessary. "Herzl was also right when he defined the establishment of a Jewish state as historic justice. The Jewish people, as all other peoples, have a right for self determination." Any peace deal with the Palestinians must be based on Israel's ability to defend itself if the agreement breaks down, Prime Minister Benjamin Netanyahu said just hours before a visit by Washington's top diplomat. "Peace rests on security. It is not based on good will or legitimacy as some think. It is based, first and foremost, on our ability to defend ourselves," he said at a ceremony marking the 109th anniversary of the death of Theodor Herzl, the founding father of Zionism. US Secretary of State John Kerry is due back in Jerusalem on Thursday evening on his fifth trip in as many months as he seeks to coax Israel and the Palestinians back to direct negotiations which collapsed nearly three years ago. Ahead of his visit, Netanyahu's rhetoric has taken on a different tone and focused more on the substance of any future talks than on the obstacles to actually starting them. "Without security, without the army that Herzl called to establish, we will not be able to defend peace, we will not be able to defend ourselves if the peace unravels," he said in remarks communicated by his office. "A basic condition for the existence of peace, for the achievement of it and for preserving it, is security." Earlier, Haaretz newspaper quoted "a senior cabinet member from Netanyahu's Likud" party as saying the premier would be ready to give up almost all of the West Bank if Israel's security needs were met. "His two key principles are maintaining the settlement blocs as part of Israel and a military presence in the Jordan Valley, without Israeli sovereignty there," the minister said. Israel’s settlement activity is wiping out the two-state solution, member of the Palestine Liberation Organization’s negotiating team said Thursday. Erekat was reacting to an Israeli decision to build 69 new housing units in the illegal settlement of Jabal Abu Ghneim (Har Homa) south of Jerusalem. 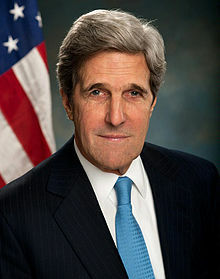 The Israeli decision is taken on the eve of a visit to the region for US Secretary of State John Kerry. Erekat said that in spite of an accelerated settlement activity, forced displacement, identity card revocations and home demolitions, Israel has signed several free trade agreements, including an Association Agreement with the European Union. “In other words, Israel has been rewarded for its crimes, leaving Tel Aviv with no incentive to move for peace,” said Erekat. “The international community should understand that in order to create the right environment for negotiations it should not grant impunity to Israel over its repeated crimes and violations. On the contrary, accountability is the best incentive to realign negotiations with international law. 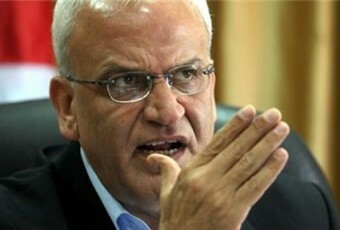 This is the only path towards a just and lasting peace between Israel and Palestine,” said Erekat. Chief Palestinian negotiator Dr. Saeb Erekat called upon the international community to hold Israel accountable for its systematic violations of international law, PLO Negotiations Affairs Department said in a press release Thursday. Dr. Erekat's call was made after Israel announced the construction of 69 new units at the illegal settlement of Jabal Abu Ghnem (Har Homa) in the Bethlehem district, a few days before Secretary Kerry's visit to the region. "Israel has a selected repertoire awaiting US officials, like what happened to Mr. Biden, which includes settlements, settlements and more settlements. It has played the same symphony since the signature of the Oslo Agreement in 1993 by almost tripling the number of settlers in 20 years, taking Palestinian land, lives and livelihoods in the process" said Dr. Erekat. "Over the same 20 year period of accelerated settlement activity, forced displacement, ID revocations and home demolitions, Israel has signed several Free Trade Agreements, including an Association Agreement with the EU. In other words, Israel has been rewarded for its crimes, leaving Tel Aviv with no incentive to move for peace." Dr. Erekat continued "settlement construction in Jabal Abu Ghnem (Har Homa settlement) is aimed at completely sealing Occupied East Jerusalem from Bethlehem, with its countless political, cultural and economic consequences. Settlement activity in and around Occupied East Jerusalem is one of the main reasons why the two-state solution is disappearing, as without East Jerusalem there will be no Palestinian State." Dr. Erekat concluded: "The international community should understand that in order to create the right environment for negotiations it should not grant impunity to Israel over its repeated crimes and violations. On the contrary, accountability is the best incentive to realign negotiations with international law. This is the only path towards a just and lasting peace between Israel and Palestine." Dr. Yousef Rizqa, political adviser to Gaza prime minister, warned against "a new catastrophe similar to the Oslo Accord catastrophe," in light of PA's willingness to resume negotiations with the Israeli side. U.S. Secretary of State John Kerry began a new tour in the region to push for the resumption of negotiations between the Israeli and Palestinian parties. He will arrive to the Palestinian territories on Thursday. Dr. Rizqa told Quds Press agency that due to Kerry's pressure on the Palestinian side, PA Chairman Mahmoud Abbas has agreed to return to negotiations. The occupation authorities are supposed to release a limited number of prisoners, detained before the Oslo agreement, and to stop the settlement construction outside the major settlements, while the Palestinian side will give up its demands concerning the borders of 1967. Haneyya's political adviser asserted that the Palestinian people are concerned due to the new waivers submitted by Palestinian side, as they mean accepting land swaps, which forms a threat to Jerusalem. Rizqa called on the Palestinian public opinion and the leaders of the National and Islamic factions to take firm positions and express their rejection of the return to futile negotiations. 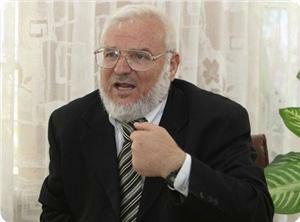 He said Abbas is holding on to the two-state solution on the 1967 borders. Erekat stressed that the Palestinians are doing everything they can to make efforts by United State Secretary of State John Kerry a success. Kerry is working to revive the peace process and resume Palestinian-Israeli negotiations, which the Palestinians say will resume only if they were based on the1967 borders and if Israel implements its obligations in settlement freeze and release of prisoners. 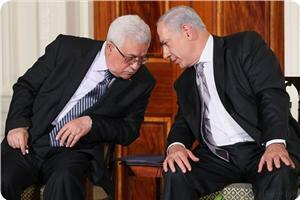 Erekat said it is too early to talk about Abbas’ future steps while he gets ready to meet Kerry in the next few days. Amidst speculations that U.S. Secretary of State, John Kerry, would organize a direct meeting with Palestinian President, Mahmoud Abbas, and Israeli Prime Minister, Benjamin Netanyahu, Israeli sources have reported that Kerry will be back in the region for a new round of talks this coming Thursday. Israeli Ynet News stated that a senior Palestinian source said that it is unlikely that Kerry will be able to bring Israel and the Palestinians to the negotiations table without preconditions. Last week, the Central committee of the Fateh Movement of President Mahmoud Abbas, held a meeting to discuss the possibility of resuming direct peace talks with Tel Aviv, but could not reach a decision and expressed rejection to international pressures regarding the resumption of direct talks “without preconditions”. The Committee said that peace talks could be resumed should Israel stop its illegal settlement activities, and officially recognize the two-state solution based on a full withdrawal from all of the occupied territories, and the release all Palestinian detainees held prior to the Oslo peace agreements. The Ynet said that Israeli sources believe that peace talks will eventually be restarted, but expressed doubts on the odds of success. According to the Ynet, President Abbas told foreign officials that he does not object to a meeting with Netanyahu in order to resume talks. According to the Analyst, Kerry told Abbas that Netanyahu expressed readiness for a partial freeze of settlement activities in large settlement blocks, and to the release of Palestinian political prisoners. According to Channel 10, Abbas does not want tension with the United States, and does not want to the one “who keeps saying no to American initiatives”. 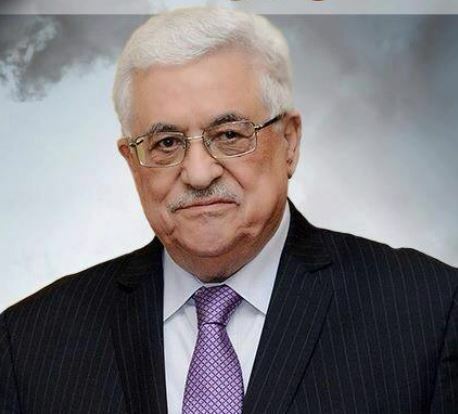 Israeli media sources have reported that Palestinian President, Mahmoud Abbas, has allegedly decided to resume direct political talks with Israel in the near future, and that an understanding was reached on the issue between Abbas and U.S. Secretary of State, John Kerry. Military analyst of Israel’s Channel 10 claimed that Abbas also received a call from Kerry promising him to talk to Israel regarding the possibility of releasing some Palestinian political prisoners as a gesture of “good will”. The analyst added that it seems that the political process between Israel and the Palestinians could resume in the coming few weeks. Furthermore, Channel 10 said that the recent shells that were fired from Gaza into adjacent Israeli areas were not fired by the Hamas movement or the Islamic Jihad, and added; “that’s why the Israeli response was not harsh on Hamas or the Islamic Jihad”. It added that the Israeli leadership is closely following the tension between Hamas and the Islamic Jihad, after a senior Islamic Jihad fighter was killed by live rounds, fired by Hamas security forces in Gaza while attempting to arrest him. The Military analyst claimed that there are serious tensions between Hamas and the Islamic Jihad, and that some Islamic Jihad fighters fired shells into Israel without the knowledge of the political leadership of the movement. He added that Hamas deployed 600 fighters across the border with Israel to prevent the firing of homemade shells. On his Facebook page, Hamas leader Mahmoud Zahar stated that the death of Islamic Jihad fighter Raed Jondiyya “was caused by tension between the Police and a member of the Islamic Jihad”. 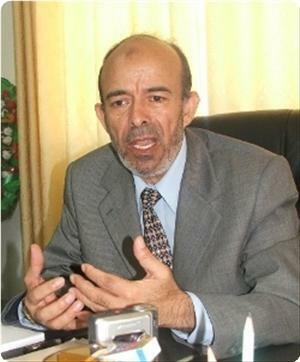 He added that leaders of the Islamic Jihad and the Hamas movements formed a joint committee that also includes the Police in order to discuss the issue, and denied any tension between the two movements. As for the position of Hamas regarding the firing of five shells into Israel on Monday morning, Zahar said that Hamas would discuss the issue with the Islamic Jihad to see whether the shells were fired in retaliation to Israeli violations, or were motivated by the death of Jondiyya. The Palestinian Authority (P.A) headed by President Mahmoud Abbas, is said to be reluctant to resume direct peace talks with Tel Aviv without a viable and clear agenda for any future talks, Palestinian officials stated Thursday. Israeli daily, Haaretz, stated some senior Palestinian sources involved in the talks told its reporter that should the United States, through its Secretary of State, John Kerry, fail to present a viable initiative that could revive talks; the P.A will not start what was described as “pointless” talks. Haaretz said that a senior Palestinian source said that the P.A does not want to appear as refusing to cooperate with the United States, but cannot just restart talks without clear answers regarding core issues topped by the Israeli withdrawal from the Palestinian territories occupied since 1967, the issue of political prisoners and various essential issues. The unnamed official told Haaretz that President Mahmoud Abbas is closely following internal Israeli debate regarding the Arab Peace Initiative that was presented to Israel in 2003, but officials in Tel Aviv have never offered any direct answers or assurances regarding the final destination of political talks. Commenting on the issue, Dr. Hanan Ashrawi, member of the Executive Committee of the Palestinian Liberation Organization (PLO) told Haaretz that the committee has not convened yet; therefore, no decisions have been made on the issue. 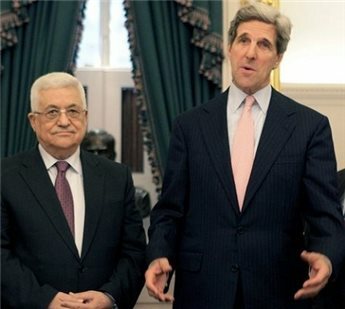 Furthermore, foreign diplomats who recently met Abbas said that he is committed to resuming talks with Tel Aviv, but neither Kerry no Netanyahu presented any initiative to resume talks, besides the fact that Israel it ongoing with its illegal violations, and its illegal settlement construction and expansion activities in occupied Palestine. Despite the fact that the officials of the P.A. in the West Bank held a number of meetings with Israeli officials in a number of capitals, including Amman – Jordan, the official Palestinian stance is that direct talks cannot resume amidst ongoing Israeli violations. Israel is also refusing to officially acknowledge the legitimate Palestinian rights of independence and self-determination, and refuses to hold talks on core issues such as the Right of Return of the Palestinian refugees, borders, natural resources and the full withdrawal from the occupied territories. Israel also insists on what it calls “its right to build and expand Jewish settlements” in the occupied West Bank, including in and around occupied East Jerusalem, despite the fact that settlements are illegal under International Law, and violate the Fourth Geneva Convention to which Israel is a signatory. I rubbed my eyes in amazement when I read in The Washington Post on June 20 that Prime Minister Benjamin Netanyahu was willing to meet Palestinian President Mahmoud Abbas (Abu Mazen) in a tent somewhere between Jerusalem and Ramallah, at any time. I checked several times to make sure I hadn’t surfed by mistake to an old edition of this important newspaper. Netanyahu’s remarks made front-page headlines in Israel. I had trouble believing that almost 20 years after an Israeli prime minister (Yitzhak Rabin) and the leader of the Palestinians (Yasser Arafat) shook hands on the White House lawn, the very willingness of an Israeli prime minister to meet with a Palestinian leader was still headline material. The tent, of all places, took me back to the  signing of the disengagement agreement between Israel and Egypt in a tent at the 101 kilometer point [between Cairo and Suez], or, a somewhat different case, the discussions between government advisor Manuel Trachtenberg and the heads of the summer 2011 social protest [in a tent in Tel Aviv]. Almost 15 years have passed since Netanyahu himself sat side-by-side with Yasser Arafat at the Wye Plantation near Washington. The agreement they both signed there said, among other things, that both sides “would immediately resume permanent status negotiations on an accelerated basis and will make a determined effort to achieve the mutual goal of reaching an agreement by May 4, 1999.” Yes, negotiations were supposed to end in May 1999, not to start, maybe, in June 2013. 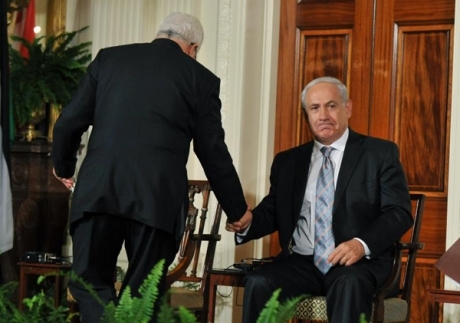 Netanyahu has learned that calling on the Palestinians/Arabs “to meet any time to talk peace” is a winning media hand. By the way, four years ago, in his Bar-Ilan speech, he was willing to go as far as Saudi Arabia to talk peace; today, he is willing to devote 15 minutes to the trip. Middle East scholar Asher Susser defines this demand as “asking the Palestinians to publicly renounce their national narrative.” Speaking at a seminar held in Tel Aviv last Thursday on June 20 on the fate of the Oslo Accord (under the auspices of the Steinmetz Center, the Dayan Center and the Netanya Academic College), the Tel Aviv University professor said this demand, like the Palestinian demand for the Right of Return, is a surefire recipe for thwarting the two-state solution and turning Israel into a bi-national state. The United States, too, understands Abu Mazen’s difficulties in dissociating himself from the town of his birth (Safed) and accepting, in fact, that Israel is not the home of 1.5 million of its Palestinian citizens. The US (and European) position regarding the borders is also closer to that of the Palestinian-Arab stand; Kerry just announced his backing for the Arab League’s peace initiative, which proposes the establishment of a Palestinian state within the June 4 boundaries (along with mutually agreed land swaps). 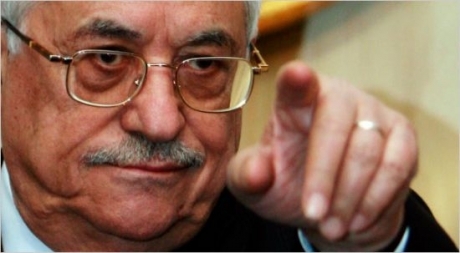 Strange as it may sound, Abu Mazen has to enter the tent. Despite his troubles at home, and even if it’s the last step he takes in his limping political career, he has to pick up the gauntlet that Bibi threw at his feet. Abu Mazen is the only man capable of forcing the Netanyahu government to choose one of two options: launching serious negotiations based on the Arab Peace Initiative, or admitting that Israel is not a partner for peace and risking the outbreak of a third Intifada (see the warning by the head of the Central Command, Maj. Gen. Nitzan Alon on June 19), international isolation and economic sanctions, as well as petitions to the International Criminal Court. By entering the tent, Abu Mazen will also enable us to see the real faces of Justice Minister Tzipi Livni and Finance Minister Yair Lapid, who promised not to take part in any government that forces Israel to choose between a binational state and apartheid. According to research presented at the seminar by economist Avichai Snir, Israel is already paying the price of diplomatic and defense instability in declining economic growth and exports. The Netanya college lecturer foresees a deterioration of Israel’s economic situation, along with the serious economic and social crisis afflicting the Palestinian market. Unfortunately, it does not appear salvation will come from Ramallah. There are growing signs that age (78) and despair are taking a toll on Abu Mazen. A European diplomat who joined his foreign minister on a visit to the Mukata’a several months ago told me that Abu Mazen couldn’t remember the name of former Israeli Prime Minister Ehud Olmert, with whom he had met dozens of times. Perhaps former Prime Minister Ehud Barak’s controversial remark on the day following the failure of the Camp David Summit on July 2, 2000, that “there’s no Palestinian partner” has turned into a self-fulfilling prophecy. Twenty years after the signing of the Oslo Accord, a better formula than the two-state solution has yet to be found. Nonetheless, when both sides’ opening positions are as far from each other as parallel lines, the time has come for the strongest power in the world to find a more realistic alternative to Bibi’s circus tent. Akiva Eldar is a contributing writer for Al-Monitor’s Israel Pulse. He was formerly a senior columnist and editorial writer for Haaretz and also served as the Hebrew daily’s US bureau chief and diplomatic correspondent. A plan for progress in the Middle East conflict that will include politics, economics and security may be put in place in the coming weeks, Quartet representative Tony Blair said Wednesday. Speaking at an Israeli conference in Jerusalem, Blair said that resolution of the Palestinian-Israeli conflict is essential for the security of Israel and to the dignity of Palestinians. “Let us hope that over the coming weeks, a plan for progress can be put in place in which politics, economics and security are aligned,” he said in reference to efforts by US Secretary of State John Kerry to revive the deadlocked peace process. However, he warned that time is running out and this window of opportunity may close forever. “We should understand: the window of opportunity will be open for only a short space of time. We must go through it together. If not, the window will close again and could even close forever. Time is not our friend. This is urgent. This is now,” he said. The visit to the region next week of US Secretary of State John Kerry was the main top story in two of the three Palestinian Arabic dailies printed Wednesday. Al-Ayyam said quoting western sources as saying that Kerry is expected in Jordan next Wednesday after which he will meet Palestinian and Israeli officials to present his ideas on starting talks on borders and security. Al-Hayat al-Jadida quoted Muhammad Shtayyeh, member of the Palestinian negotiating team, saying that Kerry is expected to start his fifth visit to the area next week, stressing that Kerry is expected to present his ideas for reviving the peace process during this visit. Al-Quds also reported on Shtayyeh’s statements, which he made to Voice of Palestine on Tuesday, but its main top front page story focused on vandalism by the Jewish terror group, Price Tag, and the slashing of cars in Abu Ghoush, an Arab town in Israel. This story was also highlighted in the two other dailies with pictures showing the anti-Arab and racist graffiti the vandals painted on the walls of the village. Al-Ayyam printed a story in which it said the Israeli military government is gradually giving legitimacy to theft of Palestinian land by Israeli settlers giving the example of the land settlers recently seized south of Nablus, near the settlement of Itamar, and which the army has turned into a military zone as a prelude to justify its theft. The paper said the old Nablus road between the village of Ein Sinia and Wadi al-Haramyeh was reopened on Tuesday after years of closure at orders by the Israeli military. Al-Quds said the Israeli military ordered seizure of 14 dunums of land from the village of Safa to annex it to the illegal settlement of Modiin Elite. The paper also reported on the meeting of the Palestinian government and said the cabinet decided to intensify field visits by its ministers to learn about needs of the public. It printed a picture of Suha Arafat, widow of Yasser Arafat, and her daughter Zahwa in a story that touched on Zahwa’s graduation from high school in Valetta, Malta, and the party the family held for her, which was attended by Palestinian and foreign figures. The three papers reported also on the visit to Turkey and meeting with it prime minister of top Hamas leaders. President Mahmoud Abbas Monday briefed Canada's Foreign Affairs Minister John Baird on the latest developments in the peace process and US efforts to revive it. Abbas received Baird in the presidential headquarters in Ramallah and asserted Palestine’s commitment to achieve a peace based on the two state solution. Abbas reiterated the necessity to release prisoners and freeze settlements' activity especially in Jerusalem in order to resume negotiations. 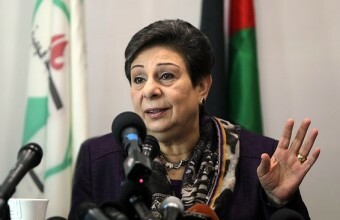 PLO Executive Committee member Hanan Ashrawi strongly denounced on Monday recent negative statements by Israeli officials regarding the future of the peace process and the Palestinian people. Ashrawi was commenting in a statement on remarks by Israeli Defense Minister Moshe Yaalon in which he rejected the Arab Peace Initiative and called it a spin and remarks by his deputy, Danny Danon, in which he claimed that there would never be a Palestinian state, whether US Secretary of State John Kerry visited or not, and that Palestinians will be governed by Jordan. Kerry is expected back in the region in the near future to follow up on efforts to revive the stalled peace process. He has already made five visits to the region during which he met Palestinian, Jordanian and Israeli officials. Member of the PLO Executive Committee Saeb Erekat Monday said in a statement issued by his office that the Government of Israel has officially declared the death of the two-state solution. “Within the past few days, several high-ranking Israeli officials, from the ministries of Foreign Affairs, Defense, and Religious Affairs, have made clear statements regarding their position to actively work against the internationally endorsed two-state solution on the 1967 border,” said Erekat, who is also chief Palestinian negotiator. “These are not isolated events but a reaffirmation of political platforms and radical beliefs. Israel has officially declared the death of the two-state solution,” he added. During the first quarter of 2013, the Israeli government increased settlement construction by 335% compared to the last quarter of 2012. Presidential spokesman Nabil Abu Rudeineh said Monday that statements by Israeli Economics Minister Naftali Bennet were dangerous. Bennet told Israeli settlers that the idea of establishing a Palestinian state is finished. “These are dangerous statements made by a minister in the Israeli government which continues to expand settlements and avoid implementing its obligations in addition to imposing conditions to any negotiations,” he said. Speaker of the Palestinian legislative council Aziz Dweik said that the latest remarks voiced by Danny Danon, Israel's deputy war minister, were racist and reflected serious intents to carry out the plan of the alternative homeland for the Palestinian people. Dweik made his remarks in response to Danon's recent statement to an Israeli TV channel in which he said that the Palestinian dream about a two-state solution and the establishment of a Palestinian state in the West Bank was a delusion and would not come true. Danon also said that the Palestinians would live in isolated cantons in the future under the administration of Jordan, while the Jewish settlers would live in the West Bank as citizens. "There is no doubt that this tale is out of context, although we have been hearing for a long time about a confederation with Jordan," speaker Dweik said in a press statement to the Palestinian information center (PIC). "I believe that these remarks, albeit out of context, reflect that the Zionist negotiation team really want to create a [Palestinian] confederation with Jordan and flout the concept of the Palestinian state with full sovereignty, and this is a kind of blatant aggression against the holy city which Israel seeks to take away from the Palestinian territories," Dweik added. "These remarks have exposed not only the real image of Israel, but also everyone negotiating with it, and this situation poses a very serious threat to the Palestinian cause, whose responsibility was assigned to the wrong people unfortunately," he emphasized. The speaker also said that US secretary of State John Kerry is on a dirty mission in the region aimed at helping the Israelis to fulfil their Zionist project on the Palestinian land through implementing their transfer plan against the Palestinians. The Swedish government may cut back on financial assistance to the Palestinians following their failure to move forward with peace negotiations with Israel, Swedish news site The Local reported. The report quoted Development aid minister Gunilla Carlsson as asking: "Is it worth continuing developing the prerequisites for a two-state solution if Israel and the Palestinians themselves do not want to sit down at the negotiating table?" At the moment, Sweden donates $107 million on a yearly basis to Gaza and the West Bank to aid the Palestinians, a move that Carlsson says has been made to fortify the Palestinian's position in any future peace talks. However, if there are no negotiations, than the Swedish demonstration of support would become meaningless. "I don't want to haggle with Swedish aid money, but I can only take the perspective of the Swedish taxpayers," Carlsson said, "one wants results." 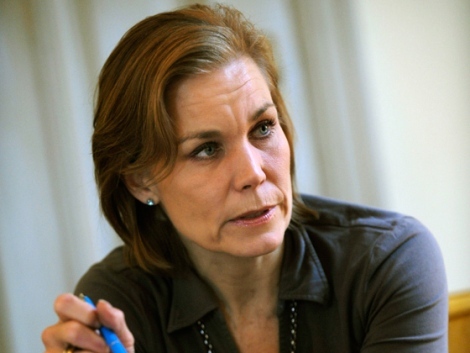 Sweden's left leaning parties slammed the aid cut-back proposal. "To drop the Palestinians in the way that the government is now considering doing is wrong," Social Democrats' aid policy spokesman Kenneth G Forslund was reported as saying. A week ago, Israel's Prime Minister Binyamin Netanyahu called out to Palestinian Authority President Mahmoud Abbas, "I call on Abbas to put pre-conditions aside and talk. Give peace a chance." Abbas responded by saying, "there will be no peace without Jerusalem (as a pre-condition). There will no security and stability without Jerusalem." 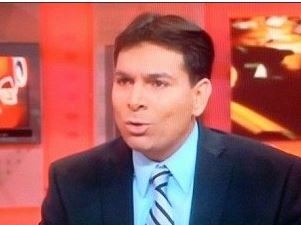 Israeli TV, Channel 1, aired an interview with Israeli deputy Defense Minister, Member of Knesset (MK) Danny Danon, who said that there will never be a Palestinian State, and that the Palestinians are "settlers", should be part of Jordan. During the interview, Danon said that “the Public should not be misled”, as Israel would never allow the establishment of a Palestinian state, whether the United States sends envoys or not, whether it presents initiatives or not. When asked if Israel would “annex” the West Bank, Dannon said that Israel will not do so, but will continue its settlements activities “on vacant lands in the West Bank”, and will act onto turning the Palestinian areas into “settlements”. He further stated that several Israeli members of Knesset agree with his opinions despite the fact they do not go public about them. Talking to Channel 1, deputy Knesset spokesperson Dr. Ahmad Tibi, leader of Ta'al Party, stated that the statements of Dannon are very serious and dangerous. “Dannon is the most ‘truthful extremist’ in the Israeli government of Prime Minister, Benjamin Netanyahu”, Tibi said, “Unlike other officials, he does not hide the dangerous intentions and plans of the Israeli government; he does now hide his extremist ideology”. Dr. Tibi added that many Israeli government ministers and officials, including Netanyahu himself, agree with the opinions of Dannon, and are deliberately placing obstacles in front of U.S Secretary of State, John Kerry, Palestinian President Mahmoud Abbas, and any official or government that tries to restart peace talks. Furthermore, Knesset Member, Ofer Shelah, of Yesh Atid (There Is Future) party, stated that “Israel is becoming the new South Africa”, the Maan News Agency have reported. “What Dannon is saying is similar to what white settlers used to say in South Africa” Shelah stated, “Jewish settlements in the West Bank are a major obstacle to any peace agreement, the Israeli occupation corrupts the Israeli society”. Israeli premier Benjamin Netanyahu reiterated his government's refusal to halt settlement expansion activities and respond to Palestinian demands in this regard. Netanyahu stated on Monday that the construction in West Bank settlements would continue and denounced the "preconditions" made by the Palestinian authority for the resumption of the peace talks as incapacitating. He added that the settlement expansion activities cannot change significantly any chance to reach a political settlement with the Palestinians and that the real question is whether the other party is sincere about recognizing the Jewish state. Netanyahu made his remarks during a session held by the Knesset committee on foreign and defense affairs. Hebrew-language media outlets reported that Israeli Prime Minister, Benjamin Netanyahu, offered Palestinian President Mahmoud Abbas the release of 50 prisoners in order to resume negotiations and reach a peace agreement between Palestinians and the Israelis. 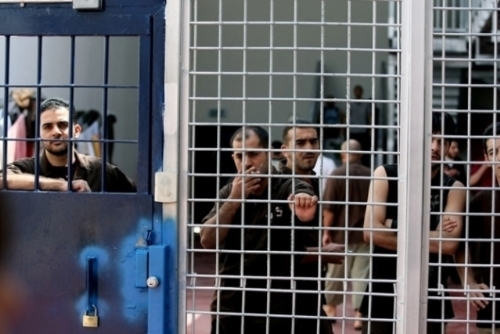 Israel has agreed to release 50 prisoners who had been in Israeli jail before Oslo agreements, yet the Palestinian president Mahmoud Abbas rejected the offer and insisted that the 107 prisoners must be released as a condition to resume negotiations. Israeli radio station said that U.S. Secretary of State John Kerry decided to postpone his visit to the region, which was scheduled to begin by tomorrow Tuesday in order to convince Palestinian side to resume negotiations with Israel. According to the radio, new date of the visit was not announced yet. It's worth mentioning that Kerry has asked Palestinian President Mahmoud Abbas to give a chance to convince the Israeli side to cease the settlement and restart negotiations and that Abbas agreed to give kerry's mission until June 20. 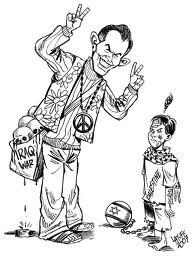 Several news outlets talk about the failure of the American efforts with the Israelis to revive stalled peace talks. Secretary of State John Kerry is returning to the Middle East next week, spokeswoman for the U.S. State Department said on Thursday. It will be Kerry’s fifth trip to the Palestinian territories since becoming America’s top diplomat in February. He will visit the West Bank and Jordan to push for a restart of direct negotiations between the Israeli occupation and the Palestinian Authority. 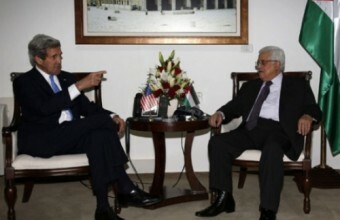 Hebrew channel 7 website reported on Friday that Kerry will meet with Palestinian President Mahmoud Abbas, Jordanian officials and Israelis; however, the details of the visit and the dates of the meetings have not been set yet. The occupation authorities have announced that they will build about one thousand settlement units in the occupied city of Jerusalem shortly after the recent visit of the American Secretary of State. Chief Palestinian Negotiator, Dr. Saeb Erekat, stated that calls made by Israeli Prime Minister, Benjamin Netanyahu, asking Abbas to resume direct peace talks with Tel Aviv are illusive and aimed at holding the Palestinians responsible for the failure of U.S. efforts to resume direct talks. Erekat, member of the Executive Committee of the Palestinian Liberation Organization (PLO), said that Netanyahu keeps talking about “peace talks without preconditions”, as part of his policy that aims at holding the Palestinians responsible for failure of talks. His statements came during a meeting with UN Secretary Envoy, Robert Serry, United Nations Special Coordinator for the Middle East Peace Process and the UN Secretary-General’s Personal Representative to the Palestine Liberation Organization and the Palestinian Authority. Erekat said that Netanyahu must declare his acceptance to the two-state solution, stop all settlement activities and release the political prisoners, especially those held since before the end of 1994. “Those are Israeli commitments, they are the road to resuming peace talks”, the official said, “Israel is avoiding its obligations, ongoing with its violations, demolishing homes, displacing the people and creating facts on the ground”. 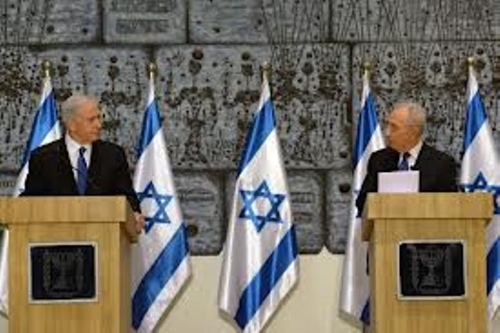 He further stated that Netanyahu and his government are trying to resume talks on Israeli terms, and that Israel “chose dictation and not negotiation”. Erekat also held separate meetings with Junya Matsuura, head of the Japanese Representative Office to Palestine, and Italian Consul General, Italian Consul David La Senza. 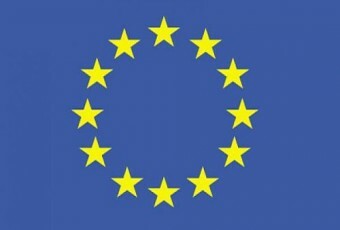 The European Union demanded Israeli Prime Minister, Benjamin Netanyahu, to stop Israel’s illegal settlement activities, and stated that the EU would support the Palestinian Authority in joining the International Criminal Court should Israel fail to stop its violations. Several senior EU leaders said that they fear Netanyahu is obstructing the efforts of U.S. Secretary of State, John Kerry, aimed at resuming peace talks between Israel and the Palestinians. They said that Israel’s settlement construction and expansion activities, especially in occupied Jerusalem, are serious threats to the prospects of resuming direct Israeli-Palestinian peace talks. Israeli sources have reported that the E.U warned Netanyahu that Palestinian President, Mahmoud Abbas, would resume the “unilateral” international diplomatic moves by trying to achieve full international recognition, and joining the International Criminal Court (ICC). The sources added that the EU would even support Palestine in joining the ICC should Israel fail to stop its settlement activities. Israel recently declared it would be constructing thousands of units for Jewish settlers in occupied East Jerusalem. Speaking to the Israeli Knesset Foreign and Security Committee on Tuesday, head of the Israeli Security Agency (Shabak), Yuram Cohen, stated that Palestinian President, Mahmoud Abbas, does not really believe that reaching a peace agreement with Israel is possible, the Arabs48 News Website has reported. Israeli daily, Maariv, quoted Knesset Members (MK), who attended the session, stating that Cohen said that “less and less Palestinians believe in the possibility of a positive political process with Israel”. Cohen also said that Abbas has nothing to gain from resuming peace talks with the current Israeli government of Benjamin Netanyahu, and added that Abbas was in a better position during previous peace talks with Israel. He said that Abbas and the Palestinian Authority (P.A) in the West Bank insist on implementing “vows made by former Israeli Prime Minister, Ehud Olmert”, and added that, as far as the Palestinians are concerned, the starting point of any future talks is what Abbas and Olmert discussed back then. “Abbas has nothing to gain from talks with Israel, Abbas will only lose in any talks with the current Israeli government, he was in a better condition in previous talks with Israel”, Cohen said, “The Palestinian leader always carries vows he got from former Israeli officials, cannot enter realistic talks with current Israeli officials; this means that there is no one on the Israeli side who would talk to him”. Furthermore, Cohen said that the Palestinian Authority of Abbas in the West Bank is strong “but could be toppled in the future”, and added that Abu Mazin (Abbas) is currently in a crisis. “Should the Palestinians move to elections, Abbas will lose his seat”, Cohen stated, “Reconciliation between Fateh movement of Abbas, and the Hamas movement is expected to boost the power of Hamas, this could lead Abu Mazin to lose his seat, or even his life, therefore, reconciliation with Hamas is not a top priority to him”. Cohen also referred to increasing Palestinian attacks against Israeli targets, and added that the situation in the occupied territories is currently “unstable”. It is worth mentioning that Maariv quoted a spokesperson of Cohen the latter made such statements to the Knesset Foreign and Security Committee. Palestinian Authority President Mahmoud Abbas has threatened to dismantle the PA should US Secretary of State John Kerry fail to "salvage the peace process," a senior PA official said Tuesday. Hussein al-Sheikh, the PA minister for civilian affairs, said that Abbas has informed Kerry that the PA's functional role would end if current efforts to revive the peace process did not succeed. "Israel, as an occupying force, would then have to assume full responsibility [over the Palestinian population]," Sheikh told the PA's Voice of Palestine radio station. He added that Abbas also informed Kerry that he agreed to extend the deadline for the secretary of state's mission until June 20, on condition that Israel releases Palestinian prisoners arrested before the signing of the Oslo Accords in 1993. 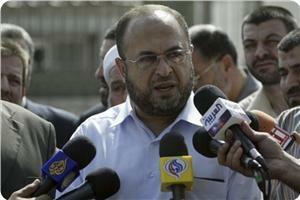 Sheikh said the PA rejects the idea of a gradual release of the prisoners, insisting that they all be freed together. Kerry is expected to return to the region next week to resume his efforts to revive stalled peace talks. Abbas declared Tuesday that he was ready to return to the negotiating table as soon as possible in order to reach a peace agreement with Israel "on the basis of a two-state solution on the 1967 borders." He spoke during a meeting in Ramallah with the president of Maldives, Mohammed Waheed Hassan. 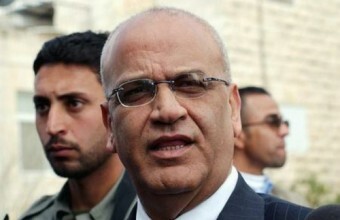 Hassan arrived for an official visit to "Palestine" and is not expected to meet with any Israeli officials. "I have affirmed more than once that the Arab and Islamic countries would be happy and recognize Israel if it withdrew from the occupied territories and a Palestinian state with Jerusalem as its capital is established," Abbas said. He added that Kerry was making strenuous efforts and was serious about reaching a solution. "The ball is now in the Israeli court," Abbas said. "The Palestinian demand is clear and the Americans and Israelis are well aware of it. The Israelis just have to accept this demand in order for the negotiations to resume." Palestinian lawmaker Abdul-Rahman Zeidan said the renewed US economic plan to help the Palestinian authority financially reflected the failure of the political process and the inability of the US administration to come up with a new idea. Zeidan told Quds Press that the economic plan of US secretary of state John Kerry was not new because the US had already used the economic peace plan with the government of Salam Fayyad and funneled millions of dollars for years into the PA treasury, but it failed. The US had desperately tried, on the other hand, to strangulate the Gaza Strip through the blockade and wars in order to draw an economic distinction between the West Bank and Gaza with the aim to deceive the Palestinian people, but its economic plan for Fayyad's government went awry. The lawmaker stressed that under the first US economic plan for the West Bank, financial and administrative corruption scandals had unfolded every day, and now the US is trying to reproduce the failed experience once again. He expressed his belief that the US does not want, in the first place, to improve the Palestinian economic situation, but it aims to buy time for Israel and bribe the Palestinian people to forget about their national rights and their struggle for liberating their land. The Palestinian trade unions reiterated their rejection of all moves to normalize relations with the Israeli occupation and stressed their adherence to the national rights and constants. In a press release on Saturday, the unions denounced the recent initiative that was made by Mahmoud Abbas to break the stalemate in the "peace process" and his meeting with the Israeli president on the sideline of the world economic forum. They stressed that the Israeli occupation is persistent in its crimes and violations against the Palestinians and must not be confronted with submissiveness. The unions also expressed their rejection of all kinds of normalization with the occupation, especially the meetings which took place between Palestinian businessmen and Israelis in occupied Haifa and world economic forum. It noted that a group of businessmen established with their Israeli counterparts a joint institution for commercial litigation. It also criticized the participation of Palestinian children in a football tournament held recently in the Israeli city Holon under the slogan "united neighbors. President Mahmoud Abbas has spoken with US Secretary of State John Kerry twice in the past 24 hours as part of efforts to revive the peace process, official news agency Wafa reported Saturday. Abbas reportedly told the US official that it is crucial that Israel releases prisoners and stops settlement activities, Wafa said. Last week, Kerry unveiled a $4 billion US plan to boost the Palestinian economy but it was met with a cool response, with an adviser to President Mahmoud Abbas saying that the leadership would "not offer political concessions in exchange for economic benefits."